In order to attract your most qualified audience to your industrial website, keyword research is crucial. The process of keyword research allows you to determine what keywords users are searching for, and what ones you should target with your online content. This free guide will help you find your most valuable keywords for your industrial company. Keyword research is the first step in creating content that will attract your most qualified leads to your website. Without it, you'll likely miss out on customers simply because you didn't create content that catered to the information they desire and with the keywords they're searching. This free guide will help you become familiar with the process of keyword research, how to incorporate high-value keywords into your content, and more. The process of keyword research is pretty straight forward, and when done correctly, can have a major impact on your industrial company. That being said, if you incorrectly or ineffectively do keyword research, you won't see the results you desire. 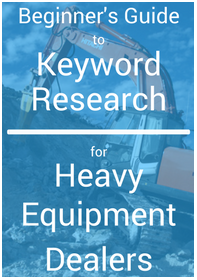 This guide can help you clear up any questions you may have about the process of keyword research and how it can help your industrial company grow. We know the ins and outs of keyword research, and we're here to help. We know you're busy running your industrial company, so let us manage your keyword strategy.